Well, here it is… Diana’s felted hat completed. 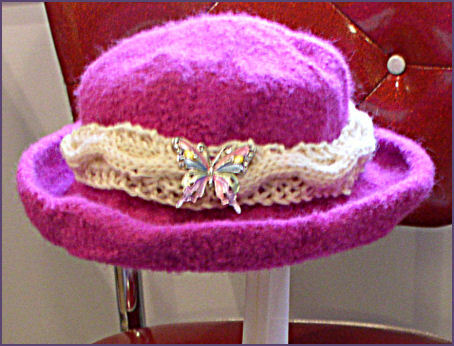 It has a zigzag cabled hat band and a butterfly pin that I found at Gracemate Jewelry. I hope Diana likes it! She’s at my mom’s house, helping with preparations for the Thanksgiving feast, so I’m planning to bring it over and surprise her with it. I may even cast on for my next hat before leaving for my mom’s house, so I’ll have a project to work on while there. Can’t decide whether it’s going to be another felted hat (I have a long list of family and friends who now want one) or the KnitPicks Long Winter’s Nap hat for me. Guess I’d better decide quickly, as we’ll be leaving pretty soon! Happy Thanksgiving to those who celebrate, and may you have many things to be thankful for.